The chart on this page contains a comprehensive list of Georgia lice removal services. Some lice removal businesses operate as head lice treatment centers. They are very similar to hair salons. Children that are being treated for lice can sit and watch videos while the professionals comb lice and nits from their hair. If a city is listed under middle column of the chart, then that business operates a treatment center. Other companies travel directly to private homes, bringing their own supplies and equipment, in order to treat and remove head lice. Approximate descriptions of the geographical areas covered by these businesses are listed in the far-right column of the chart. Click through to the business web sites for more information on the exact service areas. Those of you in the Atlanta area sure have a lot of choices! 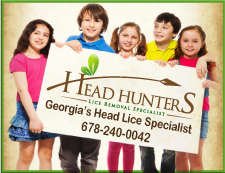 Read the page on this site regarding how to select from among lice removal services. Know of a Georgia business that needs to be added to this list? Let us know about it using the form below, and we'll add it to the database right away so it appears on this page. Thanks for helping us get the word out!